'Abilene' (Jim Hedgecock, R. 1993). Seedling #C-84-25-1. BB, height 25" (64 cm), Midseason bloom. 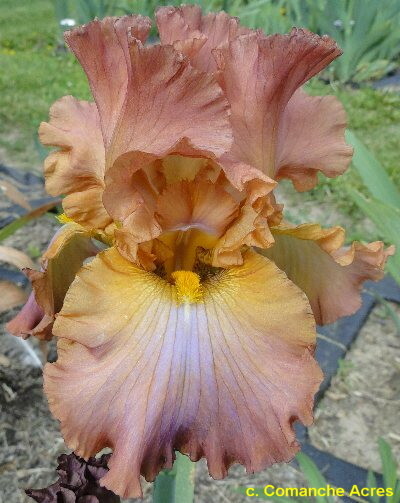 Heavily laced and ruffled pale red, falls with large violet blaze below golden yellow beard; slight sweet fragrance. 'Hilow' X seedling #73-13, involved Quadros seedlings. Comanche Acres 1994.